PQ is a chord of a circle with centre O and SOR is a line segment originating from a point S on the circle and intersecting PQ produced at R such that QR = OS. If ∠QRO = 30° then ∠POS = ? 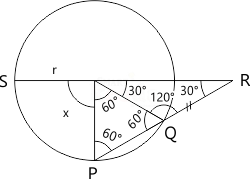 O and O' are repectively the orthocentre and cicumcentre of an acute angled triangle PQR. the point P and O are joined and produced to meet the side QR at S. If ∠PQS = 60° and ∠QO'R = 130° then ∠RPS = ? Given AC and OB intersect each other at right angle. In a right angled triangle, the circumcentre of the triangle lies. Therefore, option (B) is correct.